A 15-day-old male child, 2 nd sibling of his parents, delivered vaginally in his own home was admitted to neurosurgery department for an ulcerated big swelling on his vertex [Figure 1]. 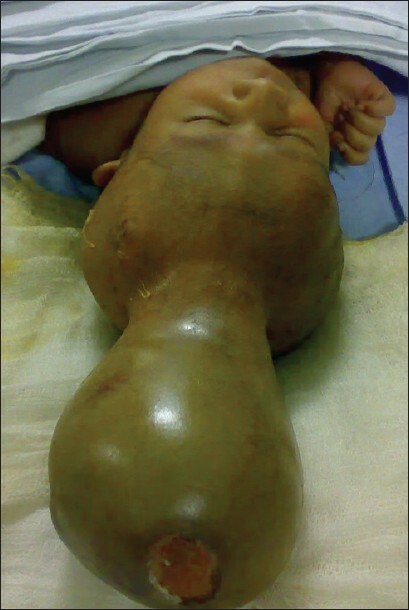 The child was 2.5 kg in weight; swelling was cystic, transilluminant [Figure 2], covered by healthy skin except at the fundus, where it was ulcerated. The child was taken up for surgery after routine screening. He was positioned supine after induction of anesthesia. Initially, the cerebro-spinal fluid (CSF) was allowed to drain through a hypodermic fluid for 15 minutes to avoid sudden decompression of grossly dilated ventricular system [Figure 3]. On the lax swelling, longitudinal elliptical skin incision was planned little away from the neck; dura was easily separated avoiding injury to the vessels run longitudinally and close to neck. 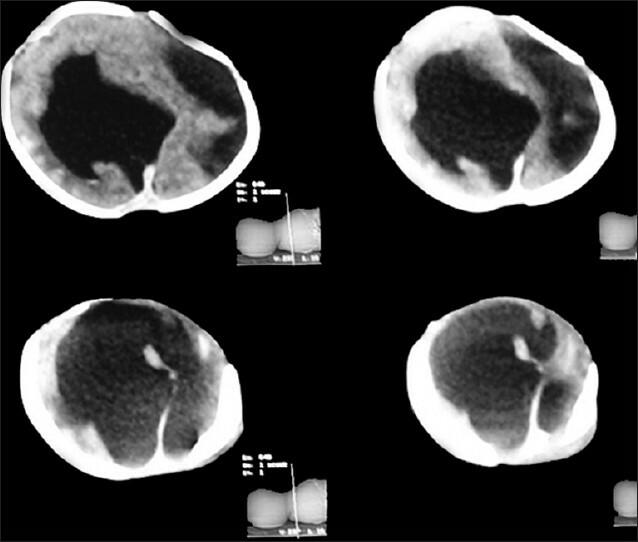 Small protrusion of brain parenchyma was seen which was not disturbed [Figure 4]. At the end, dura was closed in two layers followed by scalp closure. Rest of the hospital stay was uneventful. Till the end of 6 months there was no need of CSF drainage procedure, but the patient was lost to follow-up afterward. 1. Mahapatra AK. Management of Encephalocele. In: Ramamurthi R, Sridhar K, Vasudevan MC, editors. Text Book of Operative Neurosurgery. 2 nd ed. New Delhi: B.I. Publications Private Ltd.; 2005. p. 284-5. 2. Hoving E, Blaser S, Kelly E, Rutka JT. 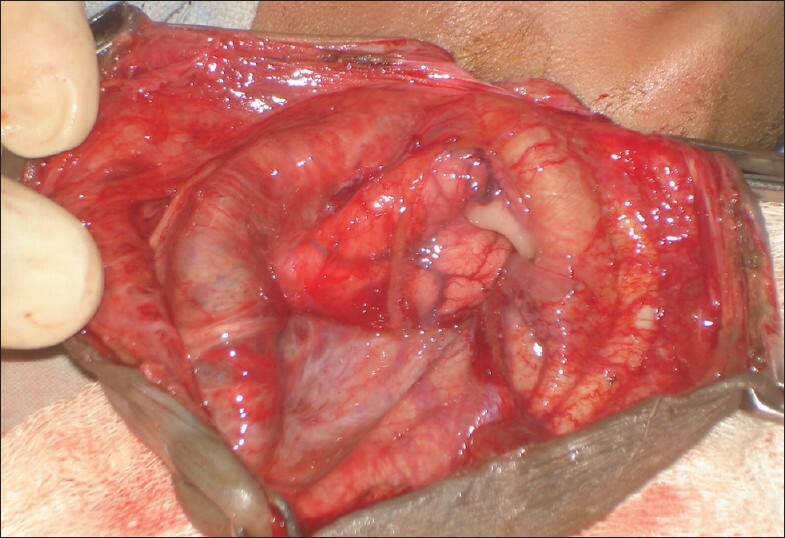 Anatomical and embryological considerations in the repair of a large vertex cephalocele. J Neurosurg 1999;90:537-41. 3. Walia B, Bhargava P, Sandhu K. Giant occipital encephalocele. Armed Forces Med J India 2005;61:293-4.